Rachel is real. Her fitness is real. Her efforts are real. Most of us can identify with the difficulties of what she has gone through, either through what we’ve experienced personally, or with the clients that we train. She turned her life around after gaining 30 pounds, smoking, and eating unhealthily. She turned to fitness and hasn’t turned back. Read her inspiring story here. I love Rachel because Rachel Keeps it Real. 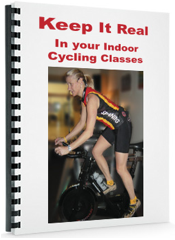 Rachel teaches authentic indoor cycling in one of the toughest markets there is—New York City. Even though she is surrounded by instructors, students, and a very vocal media who love the fluff and the crazy stuff, she stands her ground. I’m sure she is poo-poohed by those that prefer Soul Cycle. I’ve even seen her call out these these crazy types of classes on her Facebook page. She’s not afraid to take a stand. You go, girl!! She is a Schwinn Master Trainer. Need I say more? She is a cyclist. A cyclist who rides in New York City. A cyclist who rides centuries. A cyclist who competes in and wins biathlons. All that makes her bad-a$$. I love how she incorporates the mind into her training program. Rachel is in the process of getting her master’s degree in exercise physiology. This means a lot to me. She already knows a lot, but she is hungry for more knowledge. More science. We need more top trainers in the public eye who have more than just a collection of certifications and a pretty body; we need trainers who understand the science of exercise. If you have known me for a couple of years, you may know I’ve had issues with the lack of training, certification, and education of some of the most visible “trainers” on television. Who knows where Rachel will end up, but if it’s a visible fitness role with a lot of media exposure, she is the one we want representing this industry! So, will you join me and VOTE for Rachel. You can vote every single day. She’s been vacillating between #1 and #2 over the past week, so every single vote counts. Bookmark this page and vote for Rachel again and again and again! Contestants come from all 50 states in hopes of becoming the Next Best Fitness Star. Fit or Flop, an online reality series features personal trainers and fitness instructors with a passion for fitness and dream to make it big. Grand prize winners receive a $150,000 prize package and are featured as an exclusive APOGEE brand. Auditions aren’t easy though, you have to have what it takes and give it 110%. Contestants must first pass the initial round of auditions to then be featured on www.fitorflop.com. Initial auditions entail an introduction, workout demo of your program and Q&A session from our panel of celebrity judges and fitness experts. Contestants are judged on concept, star power, marketability, user-base and personality. Judges decide if you are a FIT or a FLOP to determine how America votes. If a “FIT”, you advance and have your audition and personal page featured on the website. If a “FLOP”, you can sign up and audition for the next season. As the quest for the best continues, the contest is then opened up to the public for the next 60 days to vote daily on their favorite contestant. Not only can you vote, but also visit fitorflop.com to laugh, cry and be inspired as APOGEE Media rolls out exclusive episodes. As a pilot program, this online web series has soared expectations and has taken America by storm. With the influx of interest and excitement, we are eager to start gearing up for season 2.